Once you’ve seen one convention center you’ve seen them all, right? A recent visit to the Chattanooga Convention Center left me surprised to find some nice touches that many of its bigger—and smaller—city counterparts lacked. Following are five standout features I noticed during my tour of the Chattanooga Convention Center led by Executive Director Mike Shuford, during a press trip with the Chattanooga CVB. 1. The layout and overall design of the Chattanooga Convention Center makes sense. I’m not going to name any specific venues here, but you’ve been to [insert big box convention center] before. The one with the meeting rooms haphazardly scattered around in a way that makes zero sense to navigate in a timely manner. This is not the case at the Chattanooga Convention Center. Its 21 meeting rooms and 19,000 square feet of divisible ballroom space is all located on one level and is completely adaptable to your group’s needs. And if you need help getting around, you can just look up. While walking through the Chattanooga Convention Center is a bit of a trek, a handy letter-based wayfinding system helps with directions. Finally, the importance of risk management and security remains high for planners. 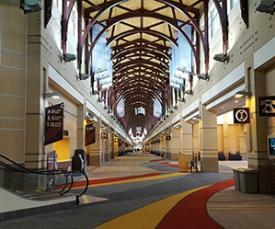 The Chattanooga Convention Center features 24/7 security surveillance and 110 cameras located throughout the facility. I was also impressed with the amount of natural lighting available throughout the building. 2. The Chattanooga Convention Center Wi-Fi is ridiculously fast. Did you know Chattanooga’s nickname is Gig City? And it’s for good reason. In 2010, Chattanooga became the first U.S. city to roll out a citywide gigabit network. In 2015, the city-owned fiber internet run by the Electric Power Board of Chattanooga (EPB) reached 10 gigabit speeds. According to the Chattanooga Convention Center website, that makes it the “fastest internet in the western hemisphere” and the tech-forward facility is capable of hosting competitive gaming events. 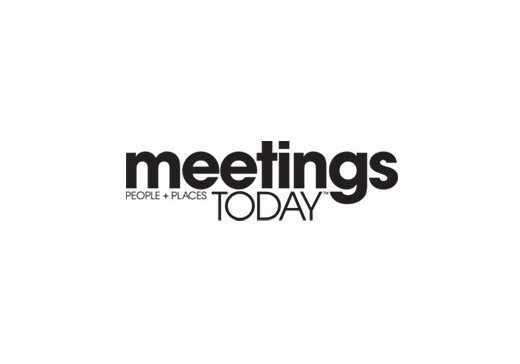 What does this mean for groups in town for meetings and events? You get some of the fastest internet speeds around at the Chattanooga Convention Center. And it comes at a reasonable price. Free. Added tech bonus: an abundance of power outlets are located throughout the convention center. 3. The Chattanooga Convention Center has its own innovative food and beverage program. The Chattanooga Convention Center ditched the standard dining fare back in 2009 and fully committed to providing an in-house, locally-sourced, customizable food and beverage offering for groups. Director of Food and Beverage Keith Quatrano is the one in charge of the menu, which can get as complex or as simple as your meeting or event requires. And yes, it can cater to special dietary needs. Quatrano was largely responsible for developing one of the first farm to table programs on a convention center-sized scale in the U.S., and he continues to develop and maintain relationships with local farmers. Beyond the on-site offerings, the Chattanooga Convention Center can even work with the city (with advance notice) to close down an area of the street for a food truck round-up outside the building. 4. The Chattanooga Convention Center remains a leader in sustainability efforts. Recycling: Convenient access to recycling is available for all meeting attendees. 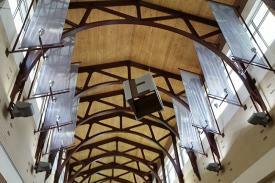 The facility actively collects for recycling all materials that are recyclable in the area. Water: Water will be served in pitchers. Food Service: Washable, reusable cups, “glasses” dishes are used. If disposables must be used, there will be no “Styrofoam” (expanded polystyrene) and disposables are high recycled content and/or bio-based and must be collected for recycling. Communications: All communication with potential guests is electronic, other than what is legally or brand-standard required to be maintained in “hard copy” form. Leftover Food: All remaining food items will be donated. The full “Green Event Policy” can be accessed on the Chattanooga Convention Center website. I would say more, but this list speaks for itself, even by today’s lofty sustainability expectations and standards. 5. Getting to and from the Chattanooga Convention Center is painless. The Chattanooga Convention Center website proudly touts on its homepage that it is “located within a day’s drive for over half the population of the U.S.” I found it helpful to note that Chattanooga was about a 2 hour drive from both Nashville and Atlanta, give or take, when pinpointing it on the map. Admittedly, the Chattanooga Airport may not be the most convenient to get to for all travelers, but there’s generally not a whole lot of waiting around when you arrive and it is very modern in design. However, once you get out beyond the airport, that’s where Chattanooga’s transportation infrastructure really shines. Sure you have the usual suspects to get around town—cabs, Lyfts, Ubers, bike share. 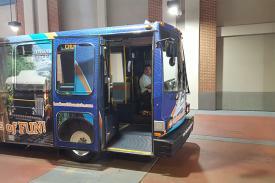 Most impressive to me was the free electric shuttle for transportation throughout downtown Chattanooga that stops at the convention center every 15 minutes. And while bike share stations have made their way across the U.S., I found Chattanooga’s system to be one of the more accessible and functional. Needless to say, getting around was not a problem, despite some minor traffic build-up here and there. That does it for now. Hopefully you learned some things. I know I did! And stay tuned for more coverage from the recent Chattanooga Meetings Discovery Tour as experienced first-hand by yours truly.